Online display advertising has been a murky business — who is actually viewing all those ads, and do those ads make a difference to them? Quantcast has been quietly trying to solve this problem since 2006, and now it’s starting to break out. I’m hearing from a reliable industry source that it has been EBITDA-profitable for a couple of years and reached a $100 million revenue run-rate six months ago. That number, I’m told, should go significantly higher by the end of 2013. What’s going on here? Quantcast sits in an interesting market position. You’ve most likely heard of it for its precise public traffic data about websites and apps via tracking pixels that publishers install on the pages of their sites. On that front, it is competing against comScore, Hitwise, Omniture and other digital-measurement firms. But these pixels are enabling its growing ad business, too. Essentially the company tracks users by pairing pixel data with browser cookies, and models it all out to generate profiles about the users of each site without collecting personal information. It then works with publishers to help them target their own ads, or it sells ad inventory directly to advertisers. Either way, the ads are reaching users in real time based on their interests and browsing habits, via the company’s big data technology. Given the broad shift to mobile usage it has also recently added features for mobile web and app data, via tracking software installed by its publishing partners. I’ve included a couple of screenshots of that data, one for reading site Goodreads’ mobile usage and another for the top 10 sites it tracks. This all sounds fancy, but do people use it? The company is now working with more than 1,000 brands, and more than half of the top 1,000 publishers on the web, CEO and cofounder Konrad Feldman tells me. It is processing more than 800,000 transactions per second. I don’t have a better view of its financials, but the revenue numbers I’m hearing indicate everything has come together well after all these years. One big reason is the growth of ad exchanges, Feldman says. Google’s DoubleClick Ad Exchange, AppNexus, Rubicon, Pubmatic, OpenX, Yahoo’s Right Media and others provide online ad tech companies and publishers with a place to sell their inventory. Advertisers and their agencies can bid on this inventory and run campaigns across the Internet. Quantcast has found its place in this ecosystem by helping buyers pull the most relevant ads from the exchanges and target them immediately to the right users. Competitors in this ad-targeting area include Turn and Rocket Fuel, with others like BlueKai providing some of the same sorts of ad-targeting tools for publishers. If you’ve noticed higher-quality ads appearing to you on your favorite websites in recent years, it is probably one of the companies you can thank (or blame, if you hate ads in the first place). The big problem for online publishing and advertising is that most of the ad dollars are still being spent on television. The shift to web has already happened for search, given that Google can target and convert purchases much better than traditional media ads. But many advertisers and ad agencies still feel most comfortable with the time-tested TV format for massive audience reach. It was this problem — using big data to help advertisers and publishers succeed on the web — that first intrigued Feldman. He’d previously started and sold a security compliance firm for large organizations, eventually discovering that the market size was just not that big. Feldman cites MLB.com’s experiences with Quantcast as an example of how the advertiser shift is taking place. “MLB teams want to sell tickets — they have that in common,” he explains as an example. “But audiences in each local market are different and change fast over time, based on factors like what else is happening in the home team’s city that day, how well team is playing, who the visiting team is, etc. Giants fans probably care more about a game against the Dodgers than against the Brewers. The result of MLB’s campaigns? It spent 20 percent of its online budget with Quantcast last year, but got 40 percent of its sales out of it, with users buying tickets twice as often as other online ad channels. What’s next for the company? Having raised $64 million in three rounds to date, and now able to fund its own growth, it’s investing across its organization. It now has 335 employees, with 100 people joining last year and another 75 on board so far in 2013. When I visited Feldman at the company’s San Francisco headquarters the company had already nearly filled up two floors of its SOMA office building and was struggling to figure out where it was going to put everyone as it continued to grow. Beyond large volumes of new employees, it’s also been bringing on some industry leaders. OpenTable CEO Matthew Roberts is joining its board. With his many years of executive experience, including its IPO, the addition could hint at an IPO for Quantcast in the near future. Although on that point of speculation, Feldman hedged. Anyway, Quantcast has also been filling out its ad sales team with a string of senior hires in recent months. David Scacco, Google’s first ad exec, will be running its partnerships with search and SEM advertisers and agencies to try to grow its display business. Another former Google exec, Peter O’Sullivan, will be focusing on large advertisers in the Western U.S. Another long-time ad sales leader, Rick Boyce, will be leading corporate sales in North America. Here are some other momentum points to note. The company has also recently opened a big new office in Dublin, where it plans to hire more than one hundred people in the next couple of years. In addition to the mobile features, it has also recently acquired ad-data startup MakeGood. In a community-friendly (and technically hiring-friendly) move it has also open-sourced its file-system software and has other companies using it. 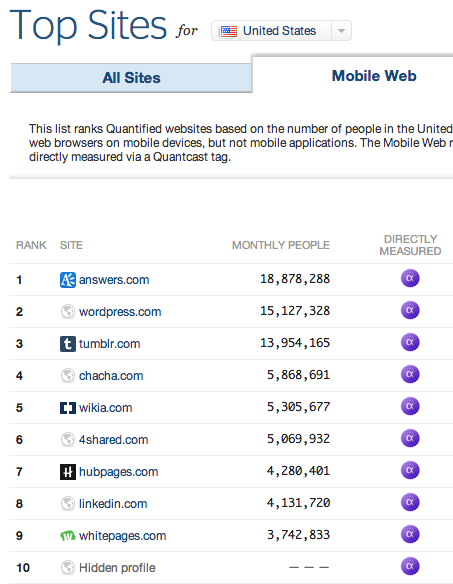 There’s a lot to like about Quantcast. For publishers, it provides a great alternate data set about your own traffic and about anyone else you’re trying to research — and it helps you make money. For advertisers and users, it helps ads matter more. He’s lived that with Quantcast progress over the years, and it’s been on my mind as we’ve turned TechCrunch around this past year.